When I taught math, one thing I drilled into my students was to consider if their answer was reasonable. Sometimes students would insist that they had checked and rechecked their answers and their computations were correct. They we’re frustrated when I’d tell them to read the problem again. “Does it seem reasonable to you that these people would buy 25,000 square yards of carpet for a house that is only 1600 square feet?” I would ask. They’d think about it for a second, realize they had miscalculated somewhere, and take their paper back to figure out where they went wrong. The reason I bring this up is because I received a call from my girlfriend Joanie a few days ago that left me scratching my head. Her daughter is getting married in a couple of weeks, and we had sent them a bunch of things off their bridal registry. “Susie, the kids are here, and they wanted me to tell you that you are very generous,” she said. I thought that they had gotten all the items we had sent them, but apparently everything hadn’t been shipped at once, and they had only gotten one item. “You must think they are very messy people,” she said. “What are you talking about?” I was puzzled. “I’m talking about the 64 cloth napkins you sent them!” she said, laughing. On their bridal registry they had asked for one set of eight napkins at $2.49 each. As nice cloth napkins usually cost no less than five or six dollars apiece, the price of $2.49 apiece was a bargain. However, the person who filled our order took it to mean that one entire set of eight napkins cost the $2.49, and since we had asked for eight at that price, he or she assumed we wanted eight sets of eight. I was charged $19.99 for all 64 napkins. Now either an entire set of eight napkins cost only $2.49, in which case you should consider ordering the Harvest napkins from Bed, Bath, and Beyond, or someone wasn’t thinking of the reasonableness of that order. If it’s the latter, I sincerely hope it wasn’t one of my students. This entry was posted in Just Blogging and tagged Education, humor, life, Math, personal, Weddings. Bookmark the permalink. I love this post! Too funny. My girlfriend said her daughter will be sharing some of the napkins with her. I’m hoping I might get a set, too! I can only think that the worker will eventually have to pay for that mistake one way or another – out of his pocket of with his job if he has made too many such errors. I don’t even know if the warehouse knows of the mistake, Colline. They will find it when they do the audits. I worked in a factory for a while and a mistake such as you described was made. Heads did eventually roll. Hahahaha! What a hilarious post! Now, the can hold a party for the whole neighborhood what with all those table napkins. A great post to end the day! Love this! Thanks, Yen. Now they need to get some more friends. Hilarious! I bet Joanie had a good laugh over that one too. My husband mentions quite often that cashiers no longer have the ability to figure out how much change the customer is owed when the register can’t give them the exact amount for some reason. It’s a good thing, Patti, that cash registers are designed for tHe mathematically challenged. Hey, a lifetime supply of napkins. Some day their kids will get a hold of them and color on them or something, and then they’ll have backups. Lots of backups. By the way, I have to admit I’m terrible at math. I use my phone calculator to figure the tip in a restaurant and can’t make change if anyone is watching me. Good thing I’ve never had to support myself by working in a store or as a waitress. But I got all A’s in math class in school. Math does not come naturally to me – it’s some kind of a number dyslexia. It might as well be in Chinese. You are not alone, HG. I think it is a right brain-left brain sort of thing. 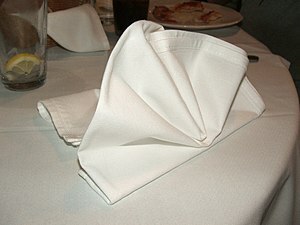 Sometimes people have no brains when it comes to math, though, like thinking a set of eight cloth napkins cost $2.49. Oh my goodness…how do stores stay in business? I don’t know, Georgette, if they have workers like that. That was quite a bargain! Do you think it would happen again, Margie? I’m thinking of ordering some for myself. 64 napkins are going to cost you $20 or $160 – a bargain either way I suppose! I can’t imagine what that worker was thinking. Oh, wait. Obviously he or she wasn’t thinking. Totally absurd but not surprising. I had lunch with a couple of friends one day. The total bill was $45 and I told the young woman I would pay for two and produced $30. She then took out a calculator to check that two thirds of $45 was $30. OMG! I’m shaking my head, Judith. Hey, I never taught math any farther up than to eighth graders, Eye! If a digital device isn’t doing the math, this generation is clueless. Clearly not one of your students. Person who inputs the data! Love this post!! Can you imagine the look on their faces when they opened the package? Your posts always give me a smile to make my day brighter. Thanks! The absurdity of it astounds me, DAF. Oh how often I run into this situation!! Actually, my best bargain was a typo from central office on my art supply order form. I ordered 48 boxes of 16 color crayolas for a bid price of about $.94 a box. When I came back from summer vacation, months later, I found Crayola cartons everywhere! I received 48 gross of boxes of those sparkling crayolas. That was in the late 80’s… I wouldn’t be surprised to learn they are STILL using that supply!! Hope your friends do not change their color scheme! Some may be good for coordinating seat covers on the dining room chairs… or throw pillows for the living room! Thanks, Carol. My husband said they could give them out as wedding favors. Love the crayon story!